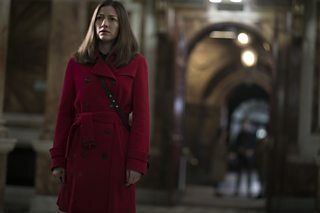 Rob Williams is the writer of BBC One's The Victim, which plays out across four consecutive nights from Monday 8th April 2019. He explains why he wanted to tell this story and why it's so pertinent now. He also explains how he got started in screenwriting and his experience on the BBC Studio's Writers' Academy, which has just relaunched. What were your reasons for wanting to write this story and why do you think it is pertinent now? There were several stories, themes and questions that coalesced to become The Victim. The profound and often negative impact of social media when it comes to the law is obviously one of them – alongside the disturbing fact that it’s never been easier to accuse someone of just about anything with little or no evidence – and mud sticks… I’d also been reading about several instances in which social media was used to vilify people, and how, because of the unique and unprecedented power of digital media, their lives were changed forever. I also have a long-standing interest in crime and punishment and the question of how far our legal system can satisfy the human need for justice. But by far the biggest thing was the characters: they’re why I wanted to write it. Both the main characters in The Victim are damaged. Anna, by the murder of her nine year-old son 15 years ago, and her passionate belief that he didn’t receive justice; and Craig, who is attacked after he is accused of being her son’s young murderer. Both characters elicit sympathy, and as a court case proceeds in the present and we watch the fall-out of the attack on Craig play out in the recent past, huge questions hang over both. Who is the real victim? Despite their passionate opposition, I found myself agreeing with both of them – and that’s the moment it came alive for me as a piece of drama. Were you inspired by real-life events? Do you have to be cautious not to get too close to them? There are obviously many real life cases that resonate with this story but it’s not ‘about’ any of them. It’s entirely fictional and it has to be – in order to truly explore any territory dramatically, I think you have to feel that your characters can go anywhere and say anything, without reference to any existing case or people. It’s important to stress that The Victim is a work of fiction and not based on any one story. There are many cases in which a juvenile has committed a horrific crime and not been publicly identified, or has been given a new identity on release. What research did you do and why did you settle on the Scottish legal system as the frame for the story? We felt that there was an over familiarity amongst the audience with English courts and their oak panels and wigs and the ‘mi lud’ of it all – and we were also excited that our structure gave us the opportunity to bring a fresh perspective to the courtroom drama. 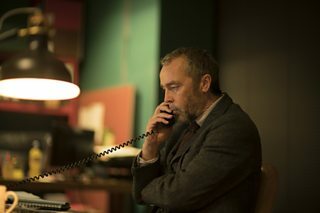 In searching for that fresh take we took an early decision that Scotland, with its unique system of law (different to England in all sorts of ways, from the procedural to the way it looks and sounds) would provide the perfect canvas for the drama. But that lack of familiarity also meant lots of research! As well as the usual suspects online, I sat in the public gallery a lot and we were very lucky to have a fantastic legal expert – a lawyer working in the criminal justice system in Scotland – who advised us and read every line of every draft of the scripts. 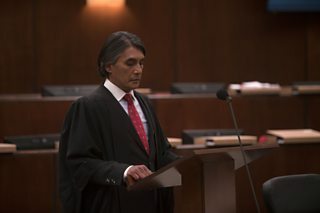 We’re incredibly proud of the authenticity of the show and even had a court worker on set to advise the cast and crew about correct procedure. What are some of the key questions raised by the drama and what do you hope that people will take away from it? The difference between the law and justice. Who is the real victim? What punishment could ever make up for the murder of a child? How far would I go in the pursuit of justice? Where does justice become revenge? The court is the natural place to seek answers - but what are the limits of that? What about when the law doesn’t give victims of crime what they need to move on with their lives? And ultimately, who does our system of law exist to serve: those whose lives are affected by crime, or the state? 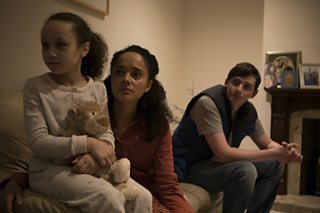 The best drama often comes out of the most difficult dilemmas, and as the characters formed and began to speak it became clear to me that this story threw up many questions without easy solutions, questions that were and are uncomfortable to me - not least as a parent myself. It’s always dangerous, isn’t it, to be too prescriptive about what people take away. My hopes are simply that people are gripped by it and that at the end of it they feel we’ve rewarded their attention, rather than simply filled a few hours of their time. According to your CV you were previously Creative Director for Penguin Books. When did you decide to move into writing yourself and why in the scripted form rather than novel writing, short stories etc? I actually have written short stories and in fact one of them had a part to play in my transition from publishing to TV writing. I wrote a story in the form of a script and as a result of a reading, was invited on to the set of Shameless. It was my first exposure to a TV set, though I’ve always loved TV drama and Paul Abbott was (and is) a hero of mine. That day proved to be the catalyst: I was suddenly certain that this was what I wanted to do. You took part in the BBC’s Writers’ Academy that ran between 2005 and 2013 and relaunched this week from BBC Studios. What was it about that scheme that made you want to take part and would you recommend it? Yes, I was on the 2008 Academy and absolutely, I’d heartily recommend it. Going in, I had almost no experience and I learned more in that twelve weeks than I have in any fixed period in my life; there’s simply nothing else like it. It’s a unique opportunity to explore the craft of screenwriting guided by a real expert in John Yorke and it equips you with a toolbox that you never stop using. Is it the case that as a working screenwriter you initially tend to write on existing or other people’s shows? Do you need to build these credits before pitching your own original series? Did you have a ‘spec’ script that you used as a calling card and why is this important? Historically I’d say yes, you have to be writing on existing shows – and even ten years ago when I was starting out I think that was the case. But I think given the pace at which the industry is changing and the increased demand for content as a result of new buyers entering the market, that may well be changing. There will always be a need to learn the craft, I think – but at the same time, I don’t imagine that execs would turn down a great idea because a writer hadn’t got a certain number of hours under their belt. A great spec script will do a lot to allay those fears so in answer to that part of the question, yes – it’s vital to have a script that represents who you are as a writer. It’s very difficult for anybody to get a sense of a writer’s voice without a spec script, no matter how many hours of TV they’ve written. Do you have experience in a US-style writers’ room as well as the UK’s more authored system? Do you have any preference between them? Yes, I worked on the first two seasons of The Man in the High Castle, partly in London and then in L.A. It was a wonderful experience – though I also really like writing in isolation! A mix of both is my preference but what I will say is that you learn so much from seeing how other writers think about story and how they pitch ideas; there’s so much more to writing than writing! Have you had projects that haven’t made it and how do you pick yourself up again after a setback? What do you know now as a writer that you wish you had when you were starting out? That nothing is wasted – from an idea to a script to a line of dialogue – rejection doesn’t rob your work of its worth; and that it’s always a process – you don’t have to have all the answers straightaway – work with people who believe in you and trust in that process.